While a running martingale, or training fork, is a common and widely used training aid, there are a few things to remember when using one. I prefer the martingales with a neck strap. I don’t like the idea of having the fork swinging in front of their legs when they are traveling with their head down. A wrong step could get a leg tangled up and cause a wreck. I also like the center ring to sit close to chest, so everything is adjusted close to the body, so there isn’t a bunch of leather to wiggle around. 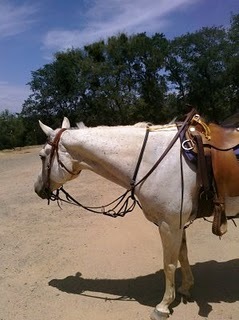 Anytime you use a neck strap you need to tie it up to your saddle. This will keep it from slipping down and getting locked up behind the horses ears. I just use a piece of twine and tie it to the ring on my pommel. One of the most important things to remember when using a martingale is if you are using snaps on the reins or a shanked bit, or anything else that could get hung up on the ring, you must have martingale stops. These prevent the rings of the martingale from catching over the snap on reins, or the ring on the shanked bit, which could cause the reins to get stuck in a position that could make the horse panic and flip over backwards. As for adjustment, that can be personal choice. Ideally, if you lift the rings of the fork towards the throatlatch they should just about reach. However, many people prefer their martingales adjusted tighter so it pulls on the reins even when the reins are sitting in “neutral” position. This causes a pulley type action when the reins are pulled and can significantly increase the pressure put on the bit, so this technique should be used with discretion. If the martingale is too loose it simply will just be useless, because it won’t put any pressure on the reins no matter how you pull. I typically use a martingale to tune up a older seasoned horse that needs a little reminder to steady their head and neck, or a green colt that is starting to learn a little fine tuning about headset and body control.